Tesco is the second-largest retailer in the world when you measure size by profits. They’re also the market leader in the UK and one of the country’s top employers. Employees either stay for decades or move on within weeks but that’s just the nature of the retail industry. We’ll take you through some Tesco salaries so you know what to expect. Most of the shop floor staff consider their wages on an hourly basis, especially those who get paid overtime. The basic hourly wage for a customer assistant begins at £6.96. That’s not too bad for replenishing the shelves, sorting out the merchandising displays and helping customers. 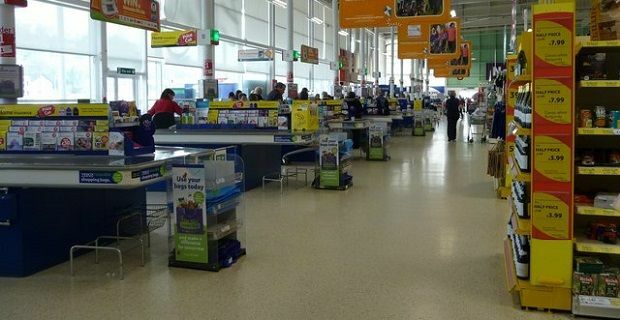 For a cashier, you can expect to earn at least £6.74 per hour, although some checkout assistants earn around £7.30 an hour for the added responsibility of dealing with payments. Delivery drivers for Tesco’s online service earn anywhere between £7 and £9 per hour. You’ll be out during all weathers and you’ll need to keep to a tight delivery schedule, but there’s a lot of autonomy in this job which isn’t normally the case with retail workers at that pay grade. If you work your way into a responsible position or if you’re looking to take your experience from another retailer to Tesco, you can expect to earn at least £9 a hour as a team leader. Other managers like the store manager and deputy store manager are paid on an annual basis. Deputy managers earn at least £22,590 while store managers get at least £25,620. Neither position is a 9 to 5 type job which is something you have to be aware of and there’s a lot of responsibility on your shoulders. Hourly rates and annual salaries increase with experience, and they differ slightly depending on the area of the country you’re working in. Shop floor staff in London for examples have been known to earn £7.60 an hour. Have you checked your nearest Tesco stores for jobs lately?